I went in to our tiny downtown, if you can call it that, for a haircut this afternoon. The street in front of the hair salon was blocked off. I had forgotten that the farmer’s market is winding up right about the time of my appointment, and had to park several blocks away. This entry was posted in 365, A Little Bit of the Everyday and tagged art, Blogs, Photo, photography, Project 365. Bookmark the permalink. It was indeed a bit of luck the way it all came about. Glad you like it. Thanks Jose. So true! A hidden gem. Such a beautiful work of Art on a side street wall. Art is everywhere, we just need to open our eyes and heart for them. I like the fact that you appreciate the things around you, big or small, you’re passion for life and beauty can be felt in every post that you make. Have a blessed day! Thank you so much IT. I truly think that since I’ve started on photography a little more seriously, I’ve become more aware of everything around me. It’s amazing that this is stuck on a side street, between buildings. Almost meant to be that one must stumble across it to see it. As you walk down this street, unless you are walking towards this building, you would have to turn to see it. And yes, got the locks trimmed up a bit. 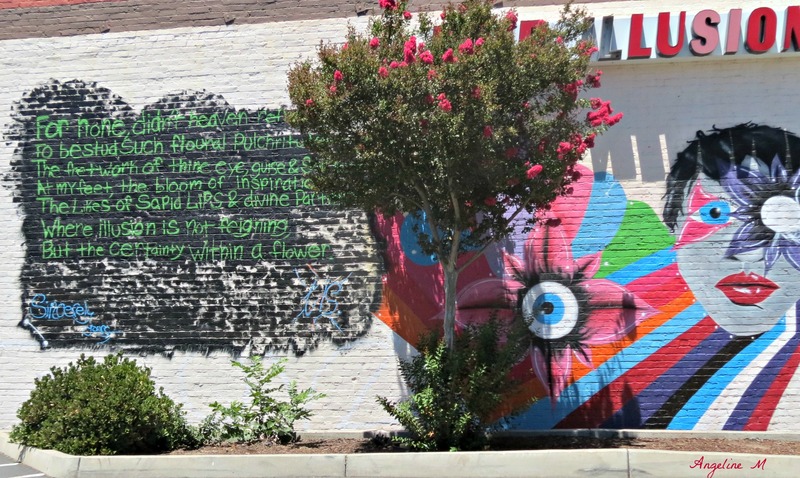 Graffiti or art…..good graffiti is great art and does cheer up our side streets. Also makes great photo too! But did you manage to get your hair cut? You are lucky to have stumbled upon this Angeline. Beautiful shot! It really was lucky; it the farmer’s market hadn’t blocked off the street I wanted to park on, I wouldn’t have seen this. all those little side turns of life…they usually end up providing the best moments Angeline…just like this did. Funny how that works sometimes. Thanks Ailsa. A bit of serendipity.